NEW YORK -- The S&P 500 closed at a record high Thursday after disappointing economic data bolstered expectations that an interest rate hike is likely to come only later in the year. Traders warned that below-average volume in recent sessions suggests that not all of Wall Street may be confident in the market's gains. %VIRTUAL-pullquote-It doesn't matter if we're at an all-time high if there are just two guys trading a stock back and forth.%"It doesn't matter if we're at an all-time high if there are just two guys trading a stock back and forth," said Brian Battle, director of trading at Performance Trust Capital Partners in Chicago. "It's something to be aware of." As the quarterly earnings reporting season draws to a close, volume on U.S. stock markets has been below the month-to-date average for several sessions. On Thursday, about 5.6 billion shares changed hands on U.S. exchanges, below the 6.3 billion average this month, according to BATS Global Markets. Data showed that jobless claims rose more than expected last week, although the underlying trend continued to point to a rapidly tightening labor market. Another report showed a surprise decline in home resales in April and persistent weakness in manufacturing in May. Federal Reserve officials have all but ruled out a rate hike next month. Investors now await Fed Chair Janet Yellen's speech Friday for new clues about when the central bank will begin raising interest rates for the first time since 2006. 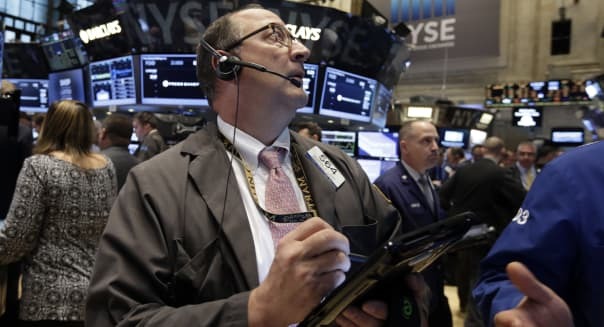 The Standard & Poor's 500 index (^GSPC) gained 4.97 points, or 0.2 percent, to end at 2,130.82 points, barely beating its previous record close of 2,129.2 from Monday. The Dow Jones industrial average (^DJI) was essentially flat, rising 0.34 point at 18,285.74, and the Nasdaq composite (^IXIC) rose 19.05 points, or 0.4 percent, to 5,090.79, just short of its record close of 5,092.08 on April 24. Recent highs set by stock indexes have won little enthusiasm on trading floors, said Gordon Charlop, a managing director at Rosenblatt Securities in New York. "There is not an underlying sense of 'Hey we're ready to bust out,' " Charlop said. "It's not as if people are jumping up and down saying there's a robust economy that's generating tremendous employment." Seven of the 10 major S&P 500 sectors were higher, with the energy index rising 0.84 percent as oil prices rose for a second day. Salesforce.com (CRM), the subject of takeover speculation for the past few weeks, rose 3.92 percent to $72.91 after posting a profit for the first time in seven quarters. Advancing issues outnumbered declining ones on the NYSE by 1,684 to 1,355, for a 1.24-to-1 ratio on the upside; on the Nasdaq, 1,384 issues rose and 1,369 fell for a 1.01-to-1 ratio favoring advancers. The benchmark S&P 500 index posted 20 new 52-week highs and two new lows; the Nasdaq composite recorded 75 new highs and 48 new lows. The Labor Department releases Consumer Price Index for April at 8:30 a.m. Eastern time. Federal Reserve Chair Janet Yellen delivers a speech on the economic outlook in Providence, Rhode Island at 1 p.m.